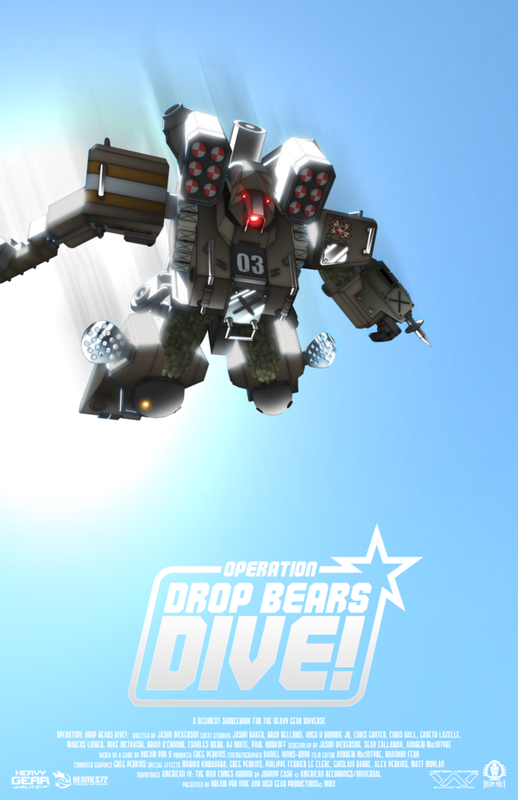 Mock movie poster for “Operation Drop Bears Dive” by KodiakDestroyer on DeviantArt. The campaign featured no Bears, of a dropping variety or otherwise (although it should’ve, really, as a pun on our D&D campaign’s mascot bear), but that’s a Heavy Gear alright. I had planned a two-game summer special to take a break from my two-year Dungeons & Dragons campaign. It took five games to clear part one of the planned double feature. This is a post-mortem of that campaign; what went right and what went wrong. Don’t worry, we’re not spending any time on a recounting of the game’s events, just the takeaways. The game is based on Heavy Gear’s fiction. If you’re not up to speed with that and sensitive to this sort of thing, perhaps best to stop reading now, but we are talking about things that were revealed in writing fifteen years ago in out of print books. “The Beast Trail” took as its main focus the destruction of Peace River in the second interpolar war on Terra Nova by an anti-matter device. The game’s fiction strongly alludes to Earth agents being responsible for the act. I wanted to stage the game around racing to stop the Earth infiltrators, but being unable to change the final outcome. This required the players to be some sort of military intelligence agents. Running out of time to come up with characters and unwilling to spend a session in character creation with a new system (I hadn’t run Heavy Gear in a decade), I opted for the premade characters in the Operation: Jungle Drums Redux scenario. The pre-written characters were a little bit mystifying to me as their tone suggested a very colorful, over the top anime story, which doesn’t seem to really gel with the rest of the setting. While this was a problem in terms of overall tone, it seemed to help the players get very quickly into their characters and bringing personality and (melo-) drama to the forefront in no time at all. I was so encouraged by this, in fact, that from now on I’m going to be suggesting over the top melodrama over hidden inner feelings any day. We played combat in three ways: mostly freeform with barely a sketch of a map, a drawn map with rough distances and full-blown hex-map tactical combat. The hex-map way was by far the best option, but understandably took lots more time; hours instead of minutes. They all managed to carry the tone of Silhouette fighting with very high stakes; it tended to be one good hit and you’re down. Players were sufficiently terrorized in all cases, fighting against GRELs and SLEDGEs (Earth-born cloned supersoldiers) and Striders (four-legged gun platforms towering over Heavy Gears). It was dramatic combat. Even on a hex-map we managed multiple over the top anime moments with Heavy Gears jostling to climb on the Strider’s back to vibro-blade it, rocket launches leaving streaks in the desert air and giant robots zig-zagging on roller skates in the sandstorm, seeing barely fifty meters (a single hex) ahead. Fighting with giant robots is a lot of fun! I would recommend playing all giant robot action on the hex-map, though: it brings a sense of warfare, tactics and seriousness to the proceedings, adding to the weight and meaning of the mecha. In a counter-intuitive way, playing it seriously with the mecha helps having fun with it. Since Terra Nova is my favorite roleplaying game setting, it comes as no surprise that I could come up with some cool set-pieces, using the game world to full effect. We played mostly in the Badlands but there were plenty of interesting sights and effective locales, including being lost in the McAllen tunnel network, fighting in a sand-storm, an archaeological dig, a maglev train being stopped due to the war setting off, and having coffee while the city came under landship bombardment. We had the works, really, from military intelligence operatives and Southerners vacationing in the North to Badlands caravans, GRELs, SLEDGEs, hovertanks, Striders, hex maps and affecting the written storyline of the game world. Come to think of it, the five-game campaign saw a lot of components. In a lot of ways it was the game I wanted to run when I was younger and very excited about the game and the world, but just didn’t have the capacity or vision to do so. There was a big pacing problem with the game (more on which below), but I had the good sense to change my grand plan as the campaign grew. My original plan was to have the heroes die in the Peace River anti-matter detonation, but after multiple games it started to feel like cheating. I came up with a mechanical system I thought was stacked against the heroes, awarding them a playing card per cleared major plot point, scoring them against the bad guys’ total. When they cleared all of that effortlessly, I essentially let them win. I severely underestimated the time it would take to play through the planned scenes. If we had skipped rules entirely, it might’ve been plausible, but I wasn’t willing to do that. We covered two scenes per game, which I should’ve guessed as that’s our D&D pace, too. This wasn’t really a problem as I had no other concrete gaming plans for summer, anyway, but it lead to serious pacing issues: when I thought we were going to finish in the next game, and that happened four times, I had no real idea where to take the game. During the finale I decided to entirely skip fighting due to its time requirements and cut very aggressively from scene to scene to make sure we finished on time. It lead to a good session to end on, actually beating the clock by an hour or so. The rules weren’t a problem per se, but we should’ve gone over the players’ options in any situation more clearly. I tried to run it as a more freeform game than our D&D but that just didn’t sit well with the military scifi setting and our D&D sensibilities. Luckily my players are vocal enough to tell me when they want to see more maps and so forth, so we adjusted to more tactical play on the fly. I had no good grasp of the players’ power level. Every time I thought I had hit them with a real challenge, they breezed through it, taking down GRELs and SLEDGEs (test tube super soldiers from Earth) and Striders (giant walker mecha) without breaking a sweat. The only reason the perceived challenge worked at all was thanks to the Silhouette system, which is very unforgiving of mistakes, and the initial encounter’s first shot resulting in a player’s mecha blowing up on the first shot. That early experience set a mood for the whole campaign. The players struggled with the game’s atmosphere all the way through (over the top anime vs hard scifi, silly characters vs drama), vocalizing their issues. I wasn’t able to fix that. With my next game I’m going to make sure we have enough scenes of the characters behaving like they’re expected to very early on to make sure the players catch on. This was probably a result of both the game world being too familiar to me and the characters as written contradicting everything else going on in the game. With aggressive cutting to new scenes and minimizing of downtime you get a dramatic game that clips along, but you risk not giving enough time for the players to really get into their characters. I probably went a little overboard with it. This is easy to fix by just adding bespoke “color” scenes with, well, downtime. I would make a point of making those about a character’s conflicts, though. I failed to resolve a big conflict that I set up in the very first scene of the game – there was a double agent in the heroes’ squad who was obviously just waiting for the right time to re-emerge. The players talked about it all the time, obviously waiting for him to make an appearance. I had planned a great return scene for him in every single game session, and in all cases the players decided to do something that made it unworkable. The next time I absolutely need an NPC to do something, I need to come up with a way the players cannot sidestep it – for example starting with the required scene. This isn’t a concern for my dear plotting, by the way, but a serious failure in the game’s narrative construction. It was a good game. I enjoyed the break from our fantasy tropes and the different group dynamic – all the players were the same, but we were missing two players from our D&D group – and everybody’s characters were rather different from the fantasy group. It’s great that even after 25 years of running games, you still make big mistakes and can learn a ton from any game you run.